KIEV, Ukraine -- The head of the Ukrainian Greek Catholic Church has expressed concern that the world’s richest countries are failing to honour a 1994 agreement that promised Ukraine security for giving up its Soviet-era nuclear weapons. Major Archbishop Sviatoslav Shevchuk meets Pope Francis in November 2013. 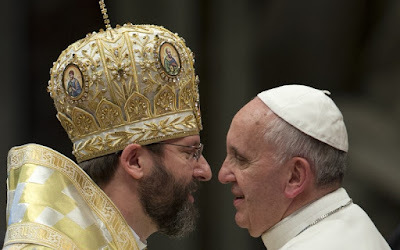 Ukrainian Catholic Major Archbishop Sviatoslav Shevchuk of Kiev-Halych said that the G7, a group of seven industrialised countries that shapes economic policies, offered little more than words about Ukraine’s security under the Budapest Memorandum on Security Assurances during its June 7-8 summit in Germany. “The G7 countries have rightly condemned actions by Moscow and pro-Russia separatists,” Archbishop Shevchuk said. In an interview with Poland’s Catholic information agency, KAI, he said the 1994 security pledge had not been recognised at the summit, although Ukraine “has been attacked and needs such guarantees more than ever”.